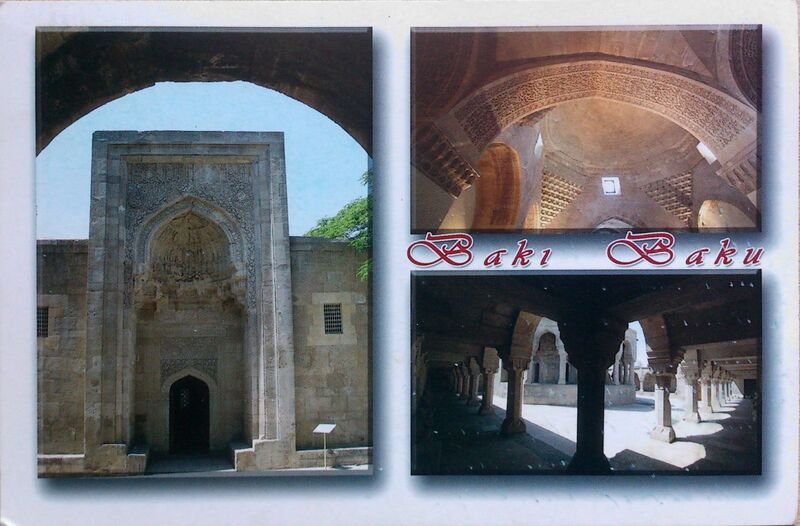 My first postcard from Azerbaijan comes from Liubov who’s from Ukraine but living in Baku. 🙂 The card pictures Palace of the Shirvanshahs – UNESCO WHS in Baku. In the 15th century the Shirvanshah dynasty, under Ibrahim I of Shirvan, transferred his country’s capital from Shemakha to Baku following a devastating earthquake, and where he committed himself to the construction of the “palace”. The building is believed to be a memorial complex built around the sacred place of worship (pir) and a tomb of Seyyid Yahya Bakuvi who was a Helwati Sufi saint. The Shirvanshahs were patrons of the Helwati Sufi order and Shirvanshah Khalilullah I was buried with his family in the grounds of the palace. Other historians argue that the building was used as the ruler’s palace, however both theories suffer from the absence of evidence. It is known however, that wells inside the grounds of the “palace” were considered to have healing qualities until recent times, as was the hill where the palace was built. The complex contains the main building of the palace, Divanhane, the burial-vaults, the shah’s mosque with a minaret, Seyid Yahya Bakuvi’s mausoleum, a portal in the east – Murad’s gate, a reservoir and the remnants of the bath-house.